His Majesty The King visited the Goensho Tshamkhang, a retreat for elderly people, built under His Majesty’s People’s Project, in Thimphu Wangsisina. 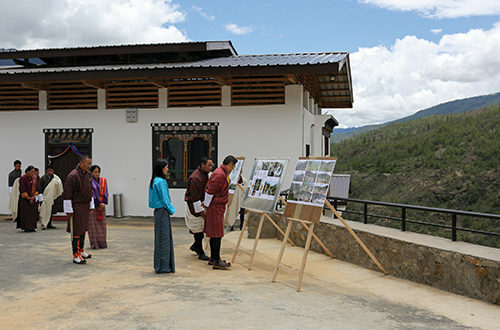 His Majesty The King, on 24th July, visited the Goensho Tshamkhang, a retreat for elderly people, built under His Majesty’s People’s Project, in Thimphu Wangsisina. The retreat, completed in June, currently accommodates 19 inhabitants who are recipients of His Majesty’s Gensho Zhabto Kidu. Recipients of the Gensho Zhabto Kidu are senior citizens who do not have family, or whose families are unable to care for them. The Goensho Tshamkhang has 13 cottages, and will be able to accommodate up to 78 inhabitants. The retreat has administrative offices, nurse’s office, a common kitchen, and common areas with spaces for prayers and recreation. The facility includes accessible toilets, and is landscaped to allow wheelchair access. Goensho Tshamkhang will be a place for elderly people who do not have family members to look after them, to live, pray, and receive medical care. A number of such elderly people across the country, have been recipients of His Majesty’s Gensho Zhabto Kidu, in the form of monthly allowances. However, many of the recipients are unable to care for themselves, or do not have a place to live. 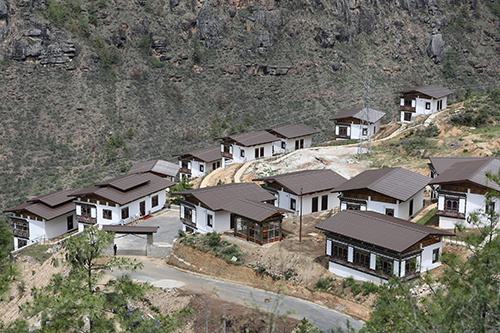 Many of the current inhabitants were temporarily accommodated at the Kidu Patient Guest house in Thimphu. Goensho Tshamkhang was built upon the Royal Command of His Majesty The King, to adequately address the needs of elderly citizens with no caregivers.